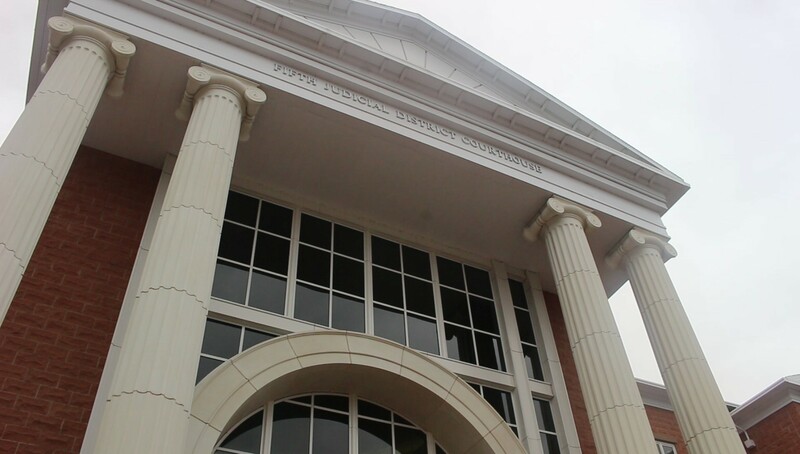 ST. GEORGE – With the courtroom packed and nearly overflowing, everyone watched and listened as the jury handed down its verdict Friday and declared Brandon Perry Smith guilty of a reduced charge of murder with special mitigating circumstances. The verdict allows Smith, 35, to escape a looming aggravated murder charge the prosecution had been pushing for. The jury acquitted Smith of aggravated assault with the use of a weapon, a second-degree felony. Co-counsel Mary Corporon looked over to defense attorney Gary Pendleton and smiled as they stood for the reading of the jury’s decision. While their client is going to prison for the Dec. 11, 2010, slaying of 20-year-old Jerrica Christensen, the reduced charge will make it possible for Smith to be eligible for parole in the future. An aggravated murder charge could have brought on a life sentence without a possibility for parole. The jury produced the verdict after deliberating over eight hours between Thursday night and Friday morning. Judge G. Michael Westfall set Smith’s sentencing for April 5. 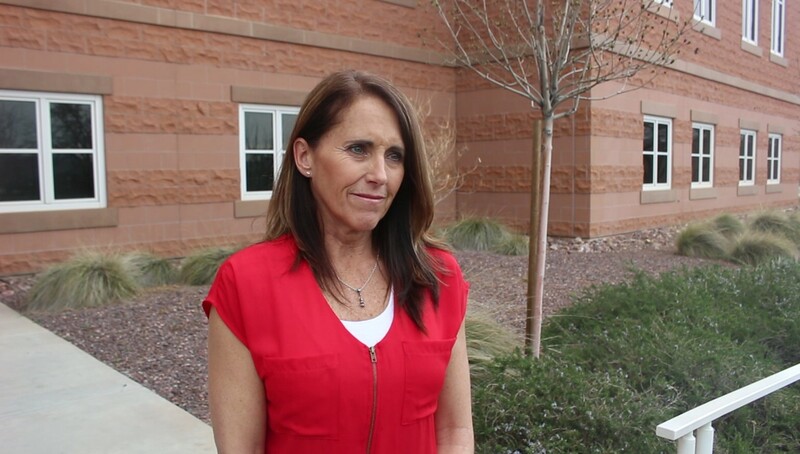 Christensen was killed in the St. George home of Paul Ashton, the second death in a violent December 2010 incident that also claimed the life of 27-year-old Brandie Jerden. Around 3 a.m. that day Christensen and her boyfriend, James Fiske, were helping Jerden move out of Ashton’s home where she had been renting a room. However, a heated argument broke out between Jerden and Ashton that resulted in Jerden hitting Ashton with plastic tool box. Ashton then shot and killed Jerden and shot and injured Fiske with a gun Smith had provided. Prior to the incident, Ashton had contacted Smith and told him he needed a gun to defend himself against people who had found out he was a confidential informant for the Washington County Drug Task Force. Though he proposed alternative solutions that Ashton rejected, Smith agreed to give him a gun while also being armed with a firearm himself. Pendleton said Smith went to Ashton’s home out of sympathy, as he knew of Ashton’s background of having been shot repeatedly by gang members in Ogden a few years before. Ashton had moved to St. George to supposedly start over. Unfortunately, the new friends he made eventually began to withdraw after his darker, more intimidating self began to manifest itself, he said. Smith had been in the background when Jerden slammed the plastic box into the side of Ashton’s face. Smith drew his own gun and ended up pointing it at Fiske. At the same time Ashton pulled his gun and shot both Jerden and Fiske, dropping them to the floor. Ashton was charged and convicted of attempted murder in connection with shooting Fiske, as well as the murder of Jerden. Ashton is currently serving a life sentence without the possibility of parole. Fiske was able to escape Ashton’s home and contact police. He was also the first witness to testify in the trial. The jury was presented with four “aggravators” supporting the aggravated murder charge against Smith. The jury agreed with three out of the four. They included: the murder being a part of an incident involving two or more deaths, Smith being involved in a kidnapping scheme (the prosecution argued Smith and Ashton supposedly planned to knock Christensen and the others out and “take them out to the desert”) and Christensen’s murder having been committed in a “heinous and depraved” manner. Smith kicked in the bathroom door and proceeded to hit Christensen in the head multiple times with a bar breaker wrench and also attempted to suffocate her. He then cut her throat in a way that caused her to bleed out. The jury did not agree with the prosecution’s 4th item on the list of aggravators which described Smith’s motive for killing Christensen. Washington County Attorney Brock Belnap had argued that Smith killed Christensen in order to silence a potential witness to a crime. The defense, on the other hand, said Smith committed murder due to being deceived and manipulated by Ashton. Smith had just witnessed Ashton gun down two people, Pendleton told the jury during closing arguments Thursday. Smith was under “extreme emotional distress” and afraid of what Ashton might do if he refused to do as told, he said. After over eight hours of going over the evidence and facts presented in the case, the jury agreed Smith may have been under extreme pressure and fear, thus constituting special mitigating circumstances in the case. Hensley praised the Washington County Attorney’s Office for its prosecution of the case. “They brought the facts accurately and honestly and did an incredible job,” she said. As for the trial concluding, Hensley said she may finally be able to get some sleep. Her family has been chained to the courthouse for the last six years, she said. “I’m really happy not to be in it again, but we still have to go back for sentencing,” Hensley said. In the years since Christensen’s death, Hensley has held candlelight vigils for her daughter on the anniversary of the murder. She also visits her daughter’s grave each year on her birthday. 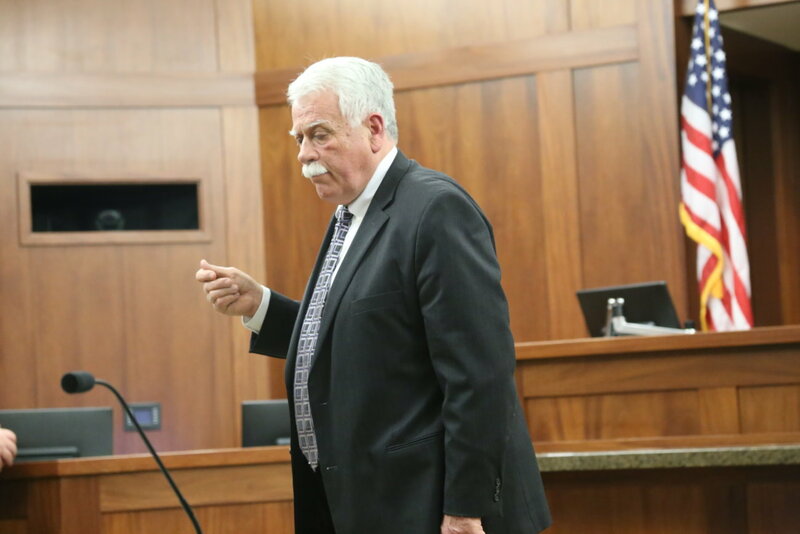 While the jury didn’t convict Smith of aggravated murder, Belnap said he was glad jury members recognized the case had aggravated elements to it. He was also happy the trial was over. “There’s a great deal of satisfaction to be had from getting to this point where a jury heard the evidence and makes a decision,” Belnap said. 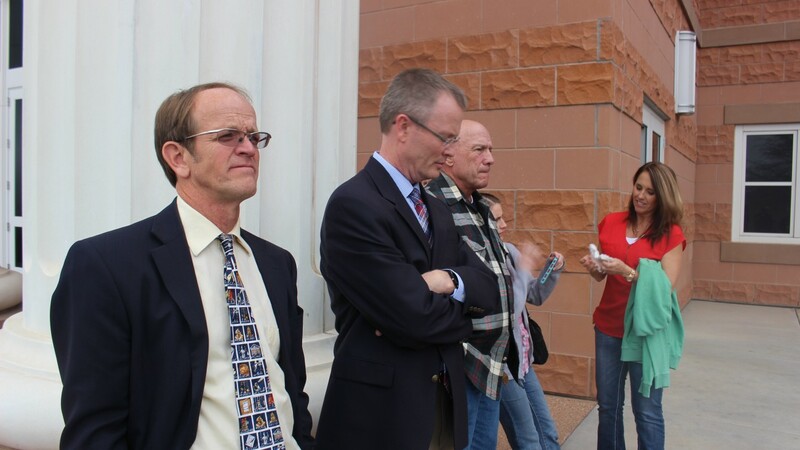 The six-year road to the two-week trial has been a long and intense one for everyone involved, Belnap said. He compared it to running a marathon in which the last six miles of the race lasts every single day. The verdict stirs mixed feelings for Fiske. On one hand he is relieved the trial is over, yet on the other he is mad that Smith wasn’t charged with aggravated murder. Following the murders, Fiske said he turned to heavy drug use to dull the pain and the nightmares it left behind. It would eventually land him in the Washington County Purgatory Correctional Facility for six months, he said He saw this as a chance to change and did. Fiske has since married and started a family and has a good job, he said. Still, the events of Dec. 11, 2010, are never too far away for him, he said. “I still think about it everyday,” Fiske said. Smith’s family declined to comment following the verdict. During the trial Westfall often ruled in favor of the prosecution when it came to what should and should not be presented as evidence, much to the growing frustration of the defense. At one point the defense motioned for a mistrial over the matter, which the judge subsequently denied. Corporon said at one point that not allowing certain evidence amounted to denying Smith his right to due process. Some of that evidence generally related to the defense’s argument that Smith had been intimidated and manipulated by Ashton into committing murder. If appeals are filed at a future date, Hensley said she’ll return to the courthouse as many times as she needs to in order to see justice is done for her daughter. “I will come as long and as necessary for Jerrica to have justice,” Hensley said. Feb 9: Was it willful murder or did ‘the devil’ make Smith do it? This Smith guy must have come from money or have some allies in the mormon-controlled power structure. I can’t see why this was so difficult to prosecute and took 6 years. Maybe he had some kind of mental retardation that factors in. So did the prosecution fabricate the part about him bashing the victim in the head with a wrench or what? I’m too lazy to look into this stuff, but it leaves lots of questions.. I was a Juror …there is a lot more to the Justice system then people realize. Being a part of the Jury was life changing and eye opening to what others are willing to live with within their own hearts. My heart goes out to the victims…it is unimaginable the pain the continues to linger, but it seems this outcome had to be found in a manner to give the family some type of closure at this point in time. There was no evidence of Autism to me but they won many over that Brandon Smith had it…I am shocked that they don’t go into detail about what the special mitigation was about either. Also for the Aggravated Assault – 7 out of 8 found him guilty…but this was another thing I was shocked they did not talk about or explain in the media. In the Jury Instructions if we could not find him guilty unanimously …which means all 8 had to find him guilty then we would have to mark not guilty. This still is unsettling with me for many factors. My respects toward Law Enforcement are much greater which was pretty hard to do but there presents is greatly appreciated. My respect toward the Justice System and all those involved on a daily basis is multiplied by the thousands. As for being lazy on looking stuff up…don’t bother…this also has given me a huge insight on how little we do know on what goes on in cases like this. Any questions you may have …I will be glad to shed some light on areas that I can from point of view. I’d be curious to know more about these instructions. Never heard of there being instructions on how the jury is to vote–being instructed to acquit? Is that even legal? I am not sure if any of the instructions or if the case will become public record in the future or not. However I do hope some day Jury rooms will be video recorded and released as public record down the road. But then again society seems to be in to big of a hurry to slow down and recognize there is always so much more then what you see on a video monitor/TV. But I do believe it will benefit our Justice system in a big way to progress for the future. So maybe just for Attorneys, etc. I also think they should teach our Jury system in depth in schools starting today!!! Now that the trial is over and you are free to speak about it, you should write an article for this site–maybe they will publish it. Would make for interesting reading.